As cute as they may be, kangaroos have a bit of a reputation in Australia for being jerks who may or may not pick a fight with you if you get too close. What you may not know, however, is that they also love to play soccer. Or at least that would help explain why one of the hop-happy marsupials invaded the field in the middle of a game over the weekend, chased after the ball, and assumed position as goalie. 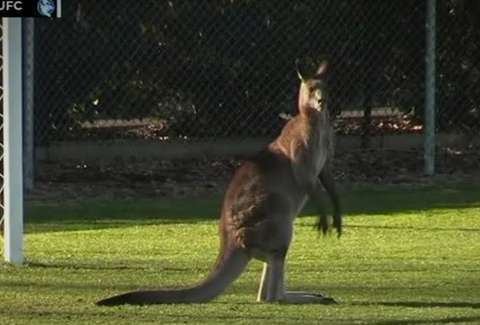 This egregious example of kangaroo FOMO went down during a local match between the Belconnen United Blue Devils and the Canberra Football Club in Australia on Saturday, when one of the wild animals made its way onto the field and forced officials to temporarily halt the game. The excitable pouched interloper first hopped the fence and slinked around during half time, then returned during the second half, eager to get in on the action. Officials attempted to get it to leave by trying to get it to chase after a soccer ball, but that backfired when the 'roo started dribbling it with its hind legs. It also briefly took up position as goal-keeper, blocking the net upright before laying down there to sunbathe. Needless to say, the whole incident provided some impromptu entertainment for the crowd and commentators, who gave a play-by-play of the animal's antics in real time. Eventually, the head coach for the Blue Devils hopped in his truck and cornered it in such a way that it was forced off the field so play could resume, and the kangaroo made its way back into its natural habitat, where it will presumably get back to practicing scissor kicks.